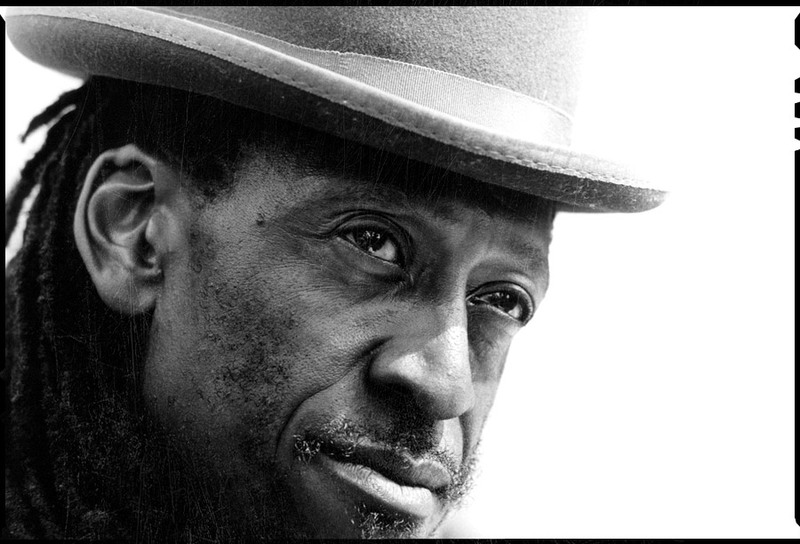 Photo Aswad – Tony Gad Robinson black and white photo shot by Floyd Celluloyd for Innermann a decade of reggae photography. Please respect the copyright. Do not use the photos without written permission. Aswad was arguably Britain's most successful reggae band, in terms of both popularity and longevity. Critical opinion on their body of work is often divided; some hail their early material as the greatest roots reggae Britain ever produced, while others find their later pop-crossover phase more distinctive and unique, even at the expense of authenticity. Regardless, Aswad's ability to adapt themselves to the changing times new musical trends, shifting personnel was ultimately the driving force behind their decades-long career. Aswad (the name is Arabic for "black") was formed in Ladbroke Grove, West London, in 1975. Originally, the group was a quintet featuring lead vocalist/guitarist Brinsley "Dan" Forde (a native of Guyana and a onetime child actor on the BBC), drummer/vocalist Angus "Drummie Zeb" Gaye, bassist George "Ras Levi" Oban, guitarist Donald "Benjamin" Griffiths, and keyboardist Courtney Hemmings. Their sound was already rather eclectic from the beginning, mixing elements of soul, jazz, and funk with hard roots reggae, lovers rock, and dub. In 1976, Aswad became the first British reggae band to sign with a major label when they landed a deal with Island Records. Their debut single, the classic "Back to Africa," was released that year and hit number one on the U.K. reggae singles chart. Their self-titled debut album - a collection chronicling the experiences of London's West Indian immigrant community - followed not long after, and the group scored another hit with "Three Babylon." By this point, Aswad already had enough of a reputation that touring Jamaican stars Bob Marley, Burning Spear, Dennis Brown, Black Uhuru often hired the group as backing musicians. Hemmings subsequently left the band and was replaced by Tony "Gad" Robinson. In 1978, Aswad moved over to the independent Grove label and issued the single "It's Not Our Wish," which was followed by their second album, the rootsier Hulet (later licensed for release by Island). Oban left the group in 1980, at which point Gad switched from keyboards to bass. Also in 1980, Forde appeared in the film Babylon, whose soundtrack featured the Aswad classic "Warrior Charge." Toward the end of the year, Aswad signed an even bigger major-label contract with CBS, and debuted with 1981's acclaimed New Chapter, a bright, soul-inflected, intricately arranged record that balanced classic and modern sounds. The singles "Love Fire" and the non-LP "Finger Gun Style" found some success that year, yet New Chapter wasn't quite the breakout commercial hit that both band and label had hoped for; the punk era and its fascination with reggae were waning, and the record was somewhat underpromoted. Aswad stripped back their sound on the 1982 follow-up, Not Satisfied, but it too met with relative commercial indifference, and the group parted ways with CBS. Before the end of 1982, Aswad issued a one-off single, the classic "Roots Rockin'," on their own Simba label, and subsequently returned to Island on the Mango subsidiary. Their next release was the concert set Live and Direct, which appeared in 1983; by this time, the core group had been reduced to a trio of Forde, Gad, and Zeb, augmented by a horn section featuring saxman Michael "Bami" Rose and trumpeter Eddie "Tan Tan" Thornton. Aswad's next studio outing was 1984's Rebel Souls, which featured their first British pop-chart singles in "Chasing for the Breeze" and the Toots & the Maytals cover "54-46 That's My Number." The 1986 follow-up To the Top found them flirting with dancehall on the singles "Bubblin'" and "Kool Noh." Having enjoyed some degree of crossover success, Aswad overhauled their approach and unmistakably went gunning for the charts with 1988's Distant Thunder. A lighter, poppier effort closer to mainstream R&B, Distant Thunder climbed into the British Top Ten as its lead single, a reggae cover of the Luther Ingram soul number "Don't Turn Around," went all the way to number one on the U.K. pop charts. Both album and single also made the Top 50 on the U.S. R&B charts, and in 1994, "Don't Turn Around" would be covered for an international smash by Ace of Base. The follow-up, "Give a Little Love," fell just short of the British Top Ten, and a non-LP single, "On and On," made the Top 20 in 1989. Aswad attempted to consolidate their commercial breakthrough on their next album, Too Wicked, which was recorded in Jamaica with producer Gussie Clarke and released in 1990. However, in spite of a guest spot from dancehall star Shabba Ranks, a host of club-friendly beats, and a minor hit in "Next to You," the record failed to match its predecessor's sales. Aswad next returned in 1994 with Rise and Shine, which restored their commercial standing in Britain via the Top Five hit "Shine," and also earned them their first Grammy nomination for Best Reggae Album. 1997's Big Up attracted somewhat less notice, and for 1999's Roots Revival, the group made a partial retreat from crossover material, covering several rocksteady classics and spotlighting guest vocals from Algerian rai star Cheb Mami. Forde left the group in 2000, and Gad and Zeb continued on as a duo.